This month sees a welcome re-release of Wolfgang Sawallisch's superb production of Die Frau ohne Schatten on the ArtHaus Musik label. 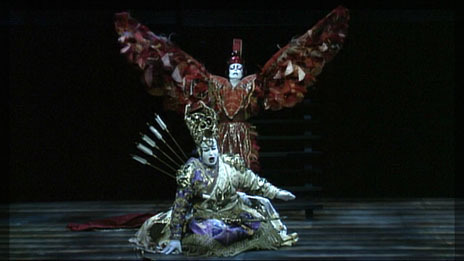 The production features excellent performances, with Peter Seiffert and Luana deVol notable as the Emperor and Empress. The production, directed by Ennosuke Ichikawa, draws on Japanese Kabuki theatre and it suits the story perfectly, reflecting the interplay between the magical and human worlds. This is a rerelease of Die Frau ohne Schatten (c. Sawallisch). conducted by Wolfgang Sawallisch, 1992. Cast: Luana DeVol (The Empress), Peter Seiffert (The Emperor), Janis Martin (Dyer's Wife), Alan Titus (Barak the Dyer), Marjana Lipovsek (The Nurse).